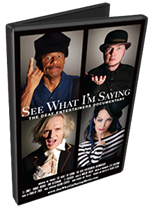 Two hours of short educational clips for discussion, signing practice and insights into Deaf culture that were filmed for "See What I'm Saying" but not included in the final film. 34 short scenes in all. Please note -- the correct trailer for the Educational DVD is above and not on the purchase site. TEACHER WORKBOOK AND STUDY GUIDE Beautiful 26-page color study guide that includes photos, discussion topics, questions and trivia about Deaf culture, See What I'm Saying and some of the best Deaf entertainers in the world. The teacher workbook covers all three DVD's ("See What I'm Saying," Me Hear None" and the "Educational DVD") in an effective way for classroom use. The Chapter Key specifies exercises for ASL & Interpreting Students, Deaf Culture, Deaf Perspectives and Entertainment. Free PDF Teacher Study Guide with every educational license purchase. "See What I'm Saying" offers a variety of license packages for schools, organizations and theaters to put on a great event or stock your library with the film. We help you organize an affordable screening, whether it is a small showing of the film at your school, a large event with the director and deaf entertainers or a simple fundraiser for your organization.